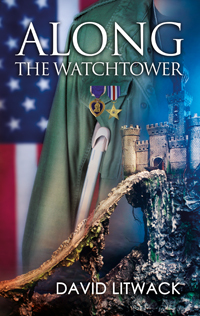 I recently read a great book, Along the Watchtower by David Litwack, that takes an interesting approach to the problems injured veterans face, and today’s post is written by him about his book and vets’ situations. Gaming and war would seem to be as far apart from each other as you can get. But while you’re in the midst of them, they share one thing in common—a sense of being in an alternate reality. I’ve always been fascinated by how much of what we consider to be reality is subjective, how each of us bring our own experiences and biases into play. But when we’re ripped from our normal lives and placed in extreme circumstances, our reality becomes totally fragmented. Such is the case with hospitals and war. A couple of years ago, I became engrossed in the online game, World of Warcraft, thanks to my son. I’m on the east coast and he’s on the west, so we’d meet every Wednesday evening in the virtual world of Azeroth, where our avatars would go on quests together. I was struck by how immersed I became in the mood of the game as we wandered through castles and crypts, solving riddles and vanquishing demons, how for a short period of time, I could totally buy in to the alternate reality. The fantasy gaming experience has a dream-like quality to it, which led me to wonder: how would this experience affect the dreams of someone whose reality has been fragmented by the trauma of war? These concepts—war, hospitals, and the fantasy world of online gaming—came together in Along the Watchtower. I began to research the effects of war on returning veterans. I learned that 30% are diagnosed with Post Traumatic Stress. That means after six months they’re still dealing with flashbacks, disturbing dreams, depression and difficulty re-assimilating into their former lives. And that doesn’t account for the many others who are seemingly able to adjust but continue to deal with inner turmoil. The war experience changes all forever. Many have suicidal thoughts (the suicide rate among veterans is triple that of the general population. More soldiers have died by their own hand than in the war itself). Many struggle with dark thoughts and have difficulty forming relationships, unable to “turn off” the normal flight or fight syndrome, leaving them suspicious in crowds and always on alert. And then, there are the physical injuries. One of the ironic successes of these recent wars is the advance in battlefield medicine. The result is that far fewer die of wounds than in prior wars. The ratio of wounded to dead in WWII was 1.1/1, in Vietnam 1.7/1. In Iraq, it’s 7/1. More are saved, but more come home with debilitating, lifelong injuries. And 68% of the wounded have some form or brain trauma, penetrating injuries from shrapnel or non-penetrating concussions from the blasts of IEDs. And I read about post traumatic stress. One of the best books is Achilles in Vietnam. Written by Jonathan Shay, a Vietnam War era PTSD counselor, it compares his clinical notes from patients to the text from Homer’s Odyssey, showing how we as human beings have dealt with war trauma across the millennia. He shows how war disrupts our moral compass, leaving re-entry into normal life as a brutal and agonizing experience. Playing a make-believe fantasy game and going to war both have a surreal quality that takes us out of our normal reality. But for war veterans, the sense of normality doesn’t return without a struggle. As part of this special promotional extravaganza sponsored by Novel Publicity, both Along the Watchtower and There Comes a Prophet by David Litwack are on sale this week. What’s more, by purchasing either or both of these fantastic books at an incredibly low price, you can enter to win many awesome prizes. The prizes include a Kindle Fire, $650 in Amazon gift cards, and 5 autographed copies of each book. All the info you need to win one of these amazing prizes is RIGHT HERE. Along the Watchtower tells of a tragic warrior lost in two worlds; a woman who may be his only way back from Hell. Get it on Amazon, Barnes & Noble, or iTunes. There Comes a Prophet A thousand years ago the Darkness came—a time of violence and social collapse. Nathaniel has grown up in their world of limits, longing for something more. For what are we without dreams? Get it on Amazon, Barnes & Noble, or iTunes. David Litwack, the once and future writer, explores the blurry line between reality and the fantastic. Visit David on his website, Twitter, Facebook, or GoodReads. This is an amazing giveaway. David seems like an interesting guy, and I dig that he enjoys spending time on Cape Cod, which is in my home state. High five to David!